Audi's 493bhp diesel supercar | What Car? 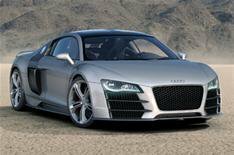 This is the Audi R8 V12 TDi Study - a 493bhp diesel-powered sports car. Company chiefs have described the car as a design concept, although if it is well received at this weekend's Detroit motor show, production is a near-certainty. Performance figures are eye-watering: the 6.0-litre engine produces 493bhp, peak pulling power of 738lb ft from just 1750rpm to 3000rpm, 0-62mph in 4.2sec and a top speed of over 300kph (186mph). All this is achieved with emissions that meet Euro 6 standards, which are not scheduled to be enforced until 2014. Other features include three performance settings - Dynamic, Sport and Race - which alter the engine, gearbox and suspension settings. In Race mode, the navigation system converts to a lap timer and gives information on the track being driven, as well as centrifugal force and boost pressure data. The unveiling of the Audi R8 V12 TDi Study was quite a coup for Audi, because most insiders had predicted that the standard 414bhp R8 would be turned into a bona fide supercar with the addition of a V10 petrol-engine. Whether that car is still coming is one of the unanswered questions, but with rumours also persisting of an R8 roadster going on sale in 2009, it's clear that Audi plans to exploit the R8 further.